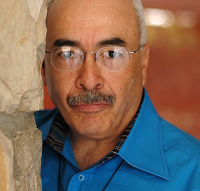 Poet Juan Felipe Herrera will give a reading at 7:00 p.m. on Tuesday, Feb. 21, in the Falvey Memorial Library first floor Speakers’ Corner. The reading, which is open to the public, will be followed by a Q&A session. Herrera is the son of migrant farm workers and was raised in the San Joaquin Valley. He attended UCLA, Stanford and the University of Iowa and has been an activist, teatrista, photographer and poet; he led the first formal Chicano trek to Mexican Indian endangered cultures. He has published several volumes of poetry, prose, children’s books and young adult novels. Among his honors are two National Endowment for the Arts fellowships and a Guggenheim Fellowship. His poetry collection Half of the World in Light won the 2008 National Book Critics Circle Award in Poetry and the 2009 PEN/Beyond Margins Award. His collection 187 Reasons Mexicanos Can’t Cross the Border: Undocuments 1971-2007 earned the 2008 PEN West award. He is currently the Tomás Rivera Endowed Chair in Creative Writing at the University of California–Riverside.